On 14-15 June 2018, in Bishkek, UNESCO Almaty Cluster Office, in cooperation with the National Commission of the Kyrgyz Republic for UNESCO, organized the National Workshop on Developing Online Curriculum to Mainstream Education for Sustainable Development and the 21st Century Competences. The workshop launched a project on mainstreaming ESD and the 21st century competencies, with financial support from Estonia. The project will contribute to promoting quality education through the use of Information and Communication Technologies (ICT). In particular, it will provide digital content on Education for Sustainable Development (ESD) for secondary education in order to improve access to information and promote interactive learning and strengthening teacher competencies in ESD and ICT in education. Experts from the Ministry of Education and Science, universities, civil society, international agencies, including UNESCO, UNICEF, Open Society Foundation, and Asian Development Bank, as well as international experts from Estonia and Russia participated in the meeting. Ms. Larisa Rozhdestvenskaya from Tallinn Russian Gymnasium shared the Estonian experience in promoting e-learning and developing online initiatives and materials at education institutions. The discussions helped contextualize the project implementation within the global trends, the existing ESD practices in Central Asia, national strategies and on-going initiatives in Kyrgyzstan and plan the way forward. In particular, participants suggested possible ways of introducing socio- emotional competencies for youth to live healthy lives and become active citizens into the curriculum of educational institutions. They identified factors necessary for changing the way of thinking, persistence of behavior, learning approaches, communication skills, etc. 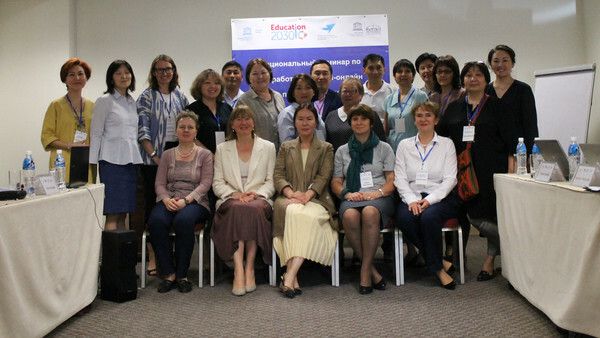 As an outcome of the meeting, a working group was established to develop online content to mainstream ESD and the 21st century competencies at the secondary education level in Kyrgyzstan. One additional positive sides of the seminar was providing a common platform for cooperation among the various stakeholders to gain a better understanding of the issues, needs and prospects of introducing ESD and ICT in education in Kyrgyzstan.